After I read this post on Weddingbee, I had to comment. It seemed like kind of a random thing, but people get really excited their deodorant. 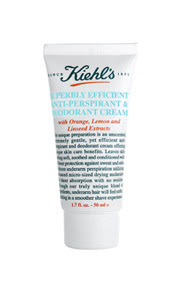 Another reader and I mentioned that we use Kiehl's Superbly Efficient Anti-perspirant and Deodorant and it started a string of conversations about it and its effectiveness compared to other deodorants. There were a few other contenders mentioned, but I just can't believe that I would like them any better than this one. I love it because it smoothes on like lotion- not a stick, gel or other goo- and absorbs into your skin. It doesn't smell like anything- not baby powder or "tropical fresh." It just fights sweat and smells and I love it. The fact that it is Kiehl's and I love all of their products didn't hurt. Then today I saw a post on Faye and Greer, one of my favorite sites, praising the Kiehl's product. I thought it might be worthwhile to post on here and join the parade! I am currently in Key Largo, Florida. It's August. It's 92 degrees and humid as can be without actual rain forming. I have spent all morning laying out by the ocean and have literally been dripping in sweat. Pretty picture, I know! I put my deodorant on yesterday around 3:00 and its still working. If I was going to trust anything on my wedding day, it would be my deodorant. My dress might rip while I am putting it on, right before I spill red wine all over it. My florist might show up with a truck-full of spray painted purple carnations. Jake might decide to go for the Fighting Illini tux after all. But I will smell fresh as a peony.